Before then, we relied on a few scholars and priests to tell us what had been written. 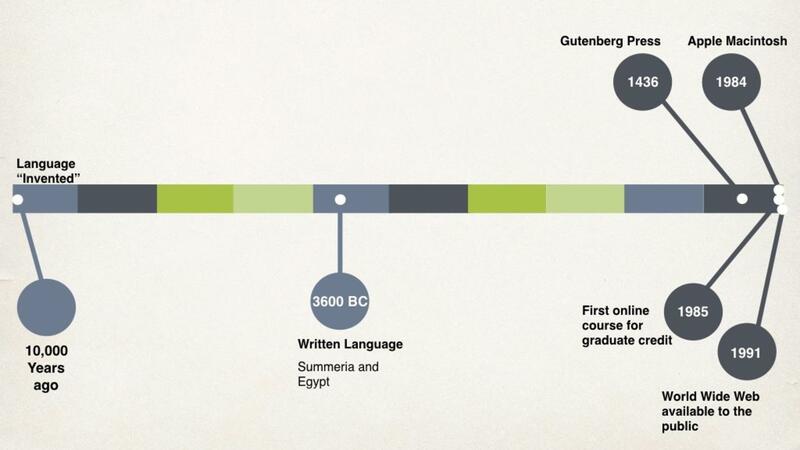 This meant that from the formation of language until general literacy, learning happened verbally. From the earliest times, we would sit around the fire and listen to tribe’s elders share what they’ve learned and what was past to them from their elders. Later, we might have had the opportunity to sit at the feet of Socrates or follow a spiritual leader. And still more recently we could sit in pews and listen to lectures from priests or scholars. Then “suddenly” we had a new way of learning. Lecture was replaced with text. More important, knowledge could be standardized. Before the printing press, there couldn’t be multiple-choice tests. Now we had a way to grade students and categorize their intelligence. Things changed again with the introduction of the personal computer, roughly 500 years after the printing press. And there are still people alive who remember a time before the World Wide Web (it was introduced to the public in 1991). These changes in storing and delivering information are relatively recent when we look at the totality of 10,000 years of language. Is it fair to say that our brains haven’t had time to adapt and evolve to new learning environments? Perhaps we should look to how learning evolved over those thousands of years to discover methods and approaches for learning within current technologies. For instance, how can we simulate sitting around the fire in an online environment? Can we mimic how our ancient ancestors conveyed information from generation to generation? Instead of lists and figures, is there room for story and symbol in our learning programs? What about play and mirth, do they have a place in contemporary learning?